Adding a leave (sick, annual, paternity, long service and family leave, mines rescue, training and other leaves) is an easy task in Fewzion. 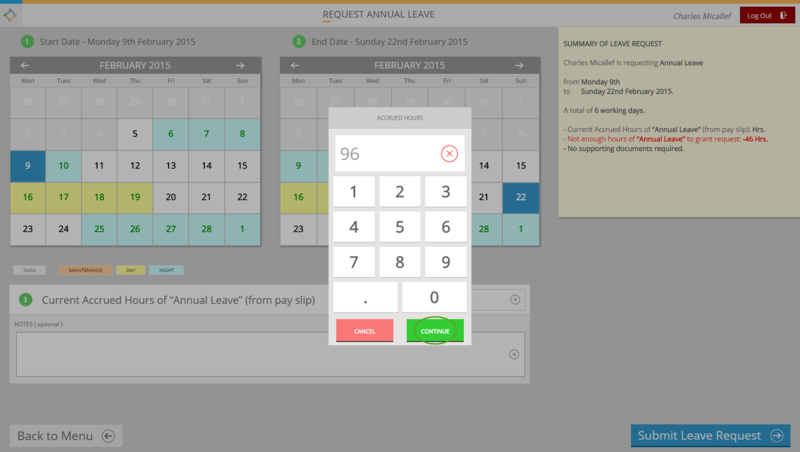 This article will introduce crew members how to use Leave Request Kiosk for adding and managing their leaves. 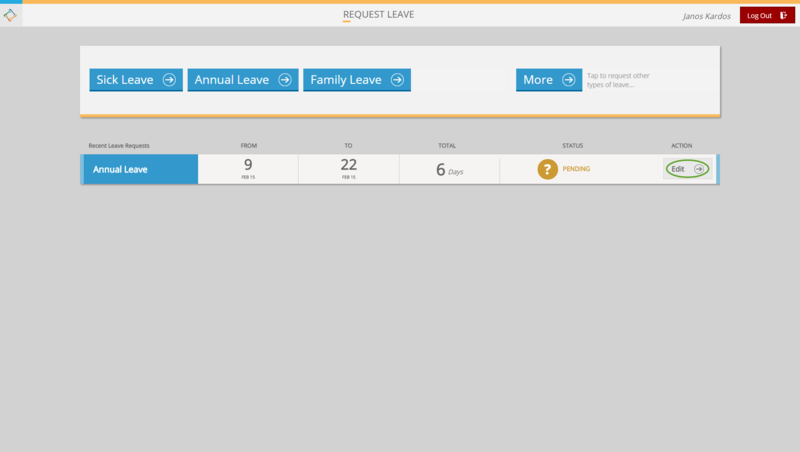 Follow these steps to add and manage leave by Leave Request Kiosk. 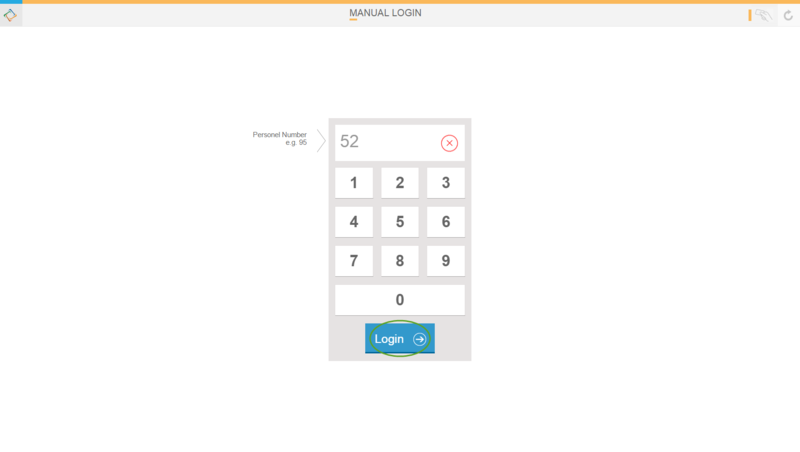 Leave Kiosk will automatically log the current user out (see below) if the system is inactive for a minute. When the screen is touched the message will disappear. The following leave requests are available by clicking on the "More" button: Paternity Leave, Long Service Leave, Mines Rescue, Training and Other. Write a note. 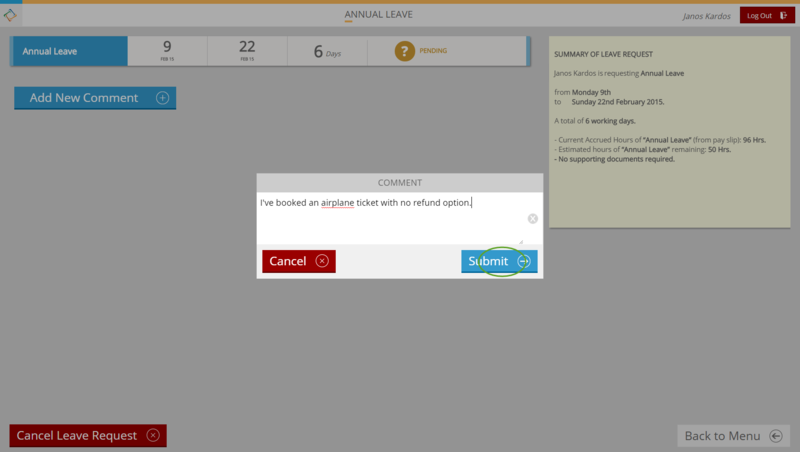 It helps leave approvers (managers) to approve your leave. 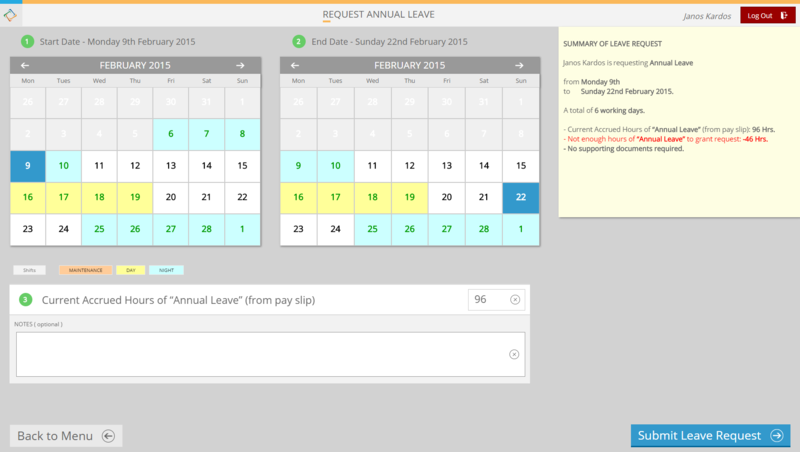 In case of Sick Leave, Annual Leave, Family Leave, Paternity Leave and Long Service Leave users required to provide the accrued hours of the leave from their payslip. 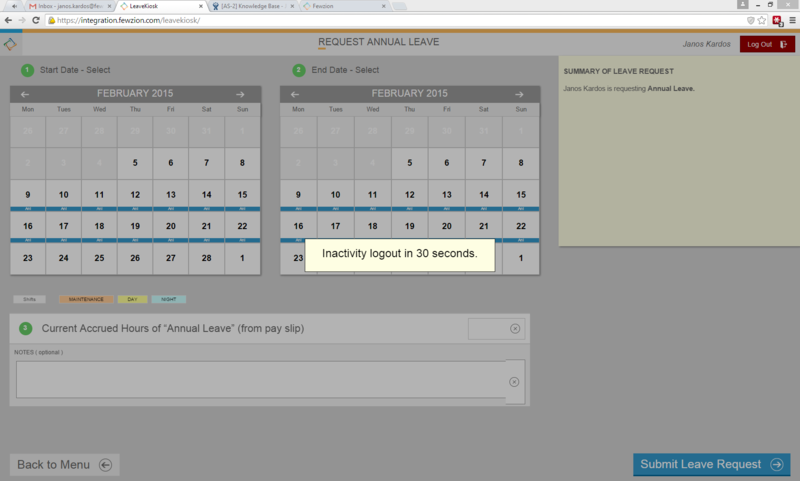 If the accrued hours are less than the requested leave hours (see below) than users cannot submit the actual leave request. 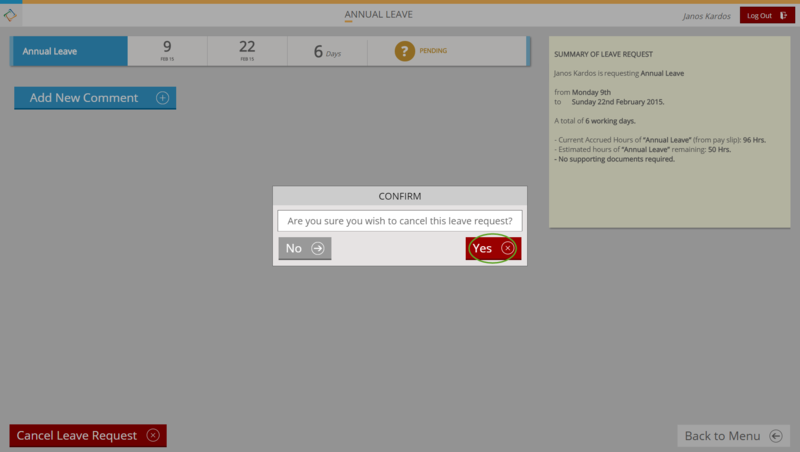 Click on the "Back to Menu" button to cancel the leave request. 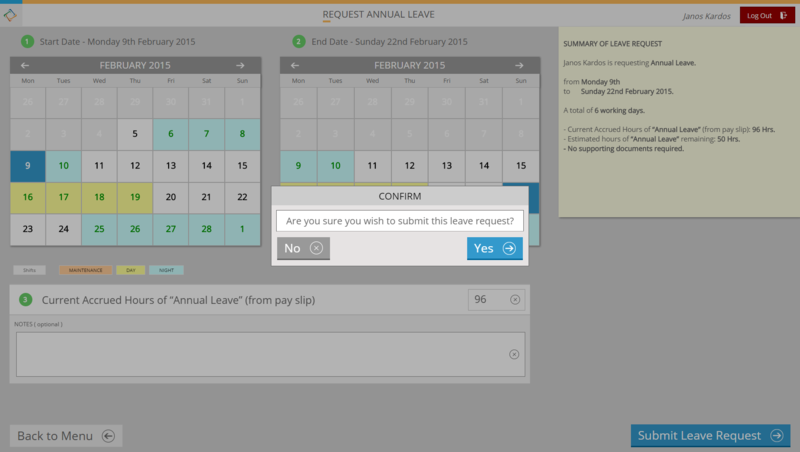 When a leave was requested by Leave Kiosk the leave approver will receive an email with the details of the leave request. When you add a new leave, the submitted leave is shown in the calendar with its short code (see below). The short codes stand for: Sk – Sick Leave, Tr – Training, Anl – Annual Leave, FL – Family Leave, Ptl – Paternity Leave, LS – Long Service Leave, MR – Mine Rescue, Oth – Other. When a new leave’s time period overlaps a submitted leave (e.g. 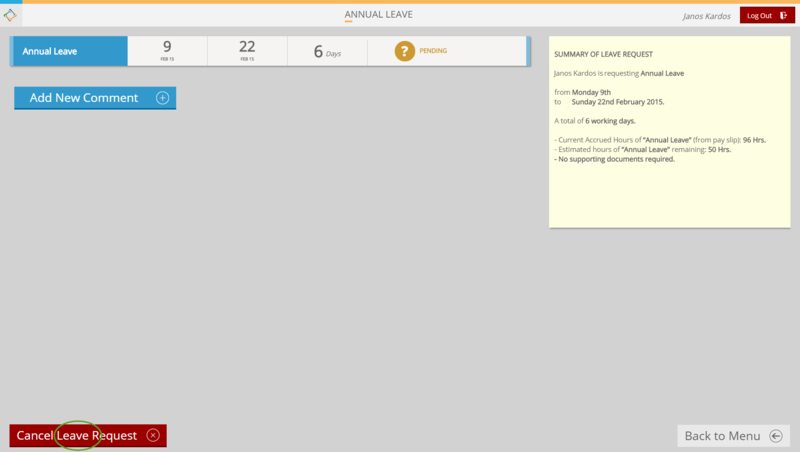 the user like to extend his/her annual leave from 16 to 19 in the showed calendar above) a "Conflict with existing leave" error message will pop-up and the user required to select the new start and end date of the leave. When the user submitted a leave request the Status is a Pending with a question mark. Thus, the request is under evaluation. When the request is granted the Status of the leave change to Approved (green tick). When the request is rejected the Status of the leave change to Decline (red exclamation mark). 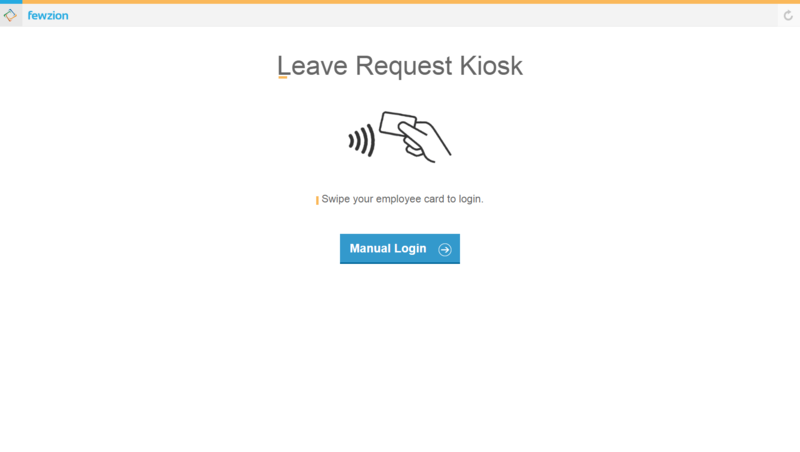 When the user cancels his/her leave request, it will appear in the Leave Kiosk. Use the "Back to Menu" button to see other submitted leaves.